Icons are a window to heaven. Through this window, we gaze upon a landscape from a distance. When we go through this door, we no longer gaze from a distance but we become part of the landscape. The purpose of icons is to enable us to see God’s brilliance and beauty inside everything. 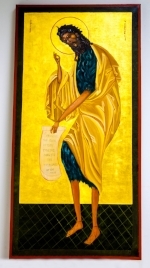 The theology of icons is to communicate Christian truth, love, forgiveness and redemption in a visual form. There are several forms of icons; one is a narrative form that visually illustrates lives of saints, parables and stories in the Bible. Another is the portrait icon that allows us to meditate on the image of the living presence and power of the holy person depicted. All icons teach and give us a model to enrich our lives and faith. St. Stephen’s is graced by six portrait icons. In an Orthodox church, these six icons would form an iconostasis or screen that separates the priest from the laity. In St. Stephen’s, the icons are not used to separate the people from the sacraments, but to help us visually enhance and remind us of Christ redeeming presence, love and grace and the contributions of saints, such as St. John, the forerunner, who prophesied Christ's ministry; St. Stephen, who was a martyr for the faith; and Mary, the mother of Christ. The Christ icon is central to the Christian concept of grace and redemption as it is central to the sacraments, sanctification, the beginning (Alpha) and end (Omega) of all things in the church. 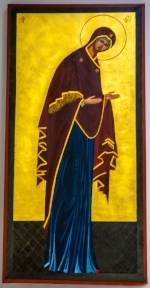 The Christ icon in our church is a full-length figure. He holds a closed book, which we may perceive as the Gospels or as the Book of Judgment in Revelation. The fingers on his right hand are bent in the position of a priest’s blessing. The fingers signal the sacred name of Jesus Christ with the Greek letters IC XC. The eyes do not look directly at us as the figure of Christ is not meant to represent Christ as the Jesus of Galilee, but the awe inspiring God-Man, King of the Universe and Judge at the end of time. Mary is referred to as Theotokos—the Bearer of God. Her hair, upper forehead and shoulders are hidden beneath a veil with a gold border. This is called the maphorion. Above the forehead and on each shoulder is a star. Tradition has generally considered them as being symbolic of her virginity; before, during and after childbirth. The icon of St. Stephen represents the patron saint of our church. In his right hand, Stephen holds a censor with twelve bells on the three chains. These symbolize the twelve apostles. In his left hand, he holds a model of our church. Stephen is most always dressed as a deacon. Michael is considered the warrior angel, who is the defender of the faith from all evil. 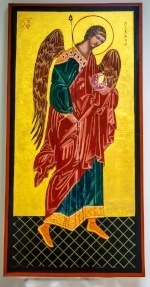 Gabriel is the messenger angel who carries messages from God to human beings. He was the angel who appeared to Mary to tell her she had been chosen to bear the Son of God. Remember, icons are meant to remind us of God, saints, and angels and what they can do to help us to understand, in a visual form, about the Heavenly Kingdom. Icons are not meant to be worshiped but are to be venerated for the knowledge they can teach us.